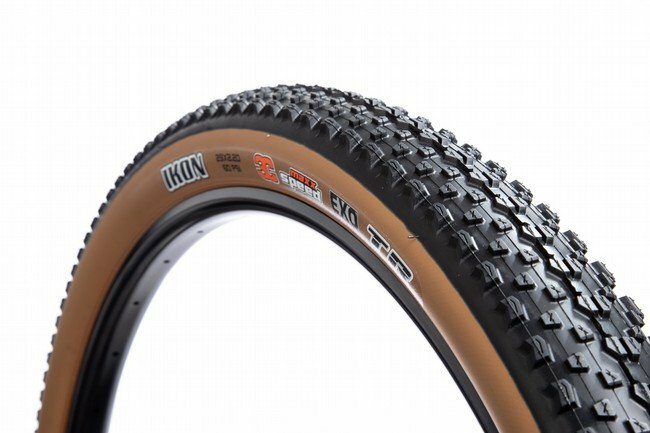 Maxxis' Ikon 3C/EXO/TR 29” MTB Tire is light yet robust, tubeless-ready, and highly versatile. The combination of grabby knobs with three rubber compounds ‒‒ 3C Maxx Speed ‒‒ delivers control and fluidity on packed or loose terrain, as well as smooth transitioning from straightaways into turns. EXO sidewall protection resists punctures and abrasions without much bulk. Size: 29 x 2.2 or 2.35 inches. Weight: 1.5lbs to 1.8 lbs. This tire is extremely fast and versatile. I have used it in mud, gravel, sand and every thing in between. The Ikon is also very durable and has held up well over many miles of racing and training. I rode this tire on the Great Divide out of Whitefish, MT with a 35 llbs of gear. The tire made it three days and then riding through some shale I sliced and punctured the sidewall. I needed a boot inside the tire and a tube but with the sealant in the tire the boot wouldn't stick. I chose this tire and now wish I would have gone to BTD for some advice. My co-rider on the trip had the same tire in the 2.35 size. That tire came apart after 10 days of riding. This is probably a great tire we were just using it for the wrong application. Telluride to Moab and no flats! I took these on a 7 day trek, hut to hut from Telluride and ending with Porcupine Rim in Moab. Not a single flat. Setting up tubeless was easy wth a pump. In the 7 days we tackled varied terrain and these tires rocked. I have a set of these set up tubeless on my Salsa Fargo, and so far so good. My off road riding is limited to gravel and simple single track, and these tires road plenty well, and deliver a plush and comfy ride. I like the retro browntan sidewalks. Well see how durable they are at the end of the summer. This tire, at low PSI, is very grippy. Corners very well and is light and fast. I also run the Maxxis Ardent tire and I dont notice any less traction. Just faster.